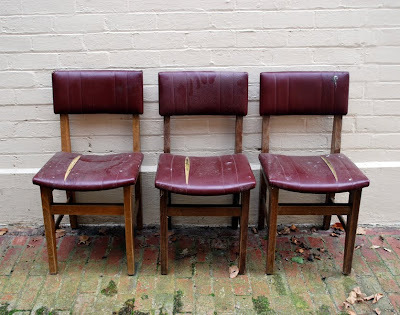 Three smelly, roadside-find chairs, with good bones. I have a smile on the dial. 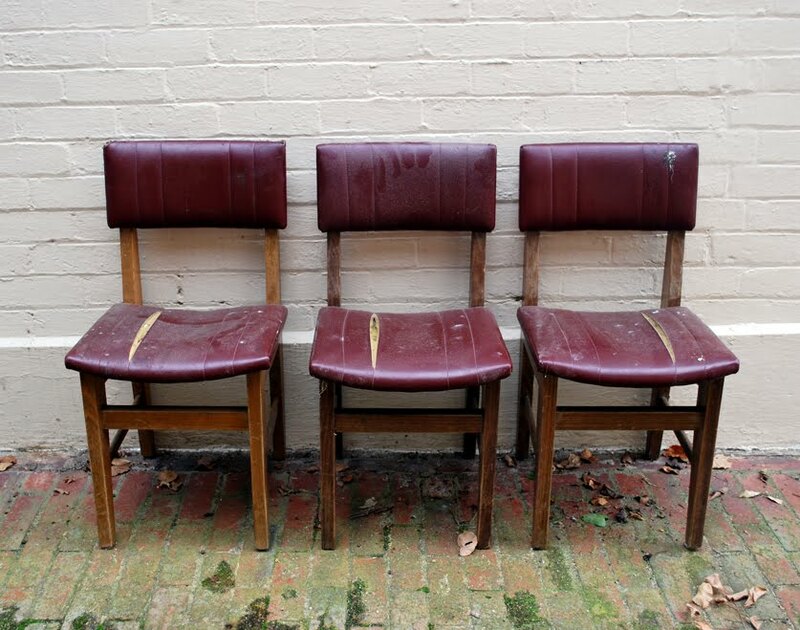 Just a bit excited about the two, smelly, roadside-find chairs, with good bones, waiting in the wings! Er...but you know me. P’raps best not hold your breath. Excellent makeoverness! Betcha those chairs are happy about their bones now! You've done a lovely job - I never get road side finds like that. I love the chair, what a fantastic job, and a huge one. I do love it! I do! But the "a" makes my heart sing. Gorgeous make over! 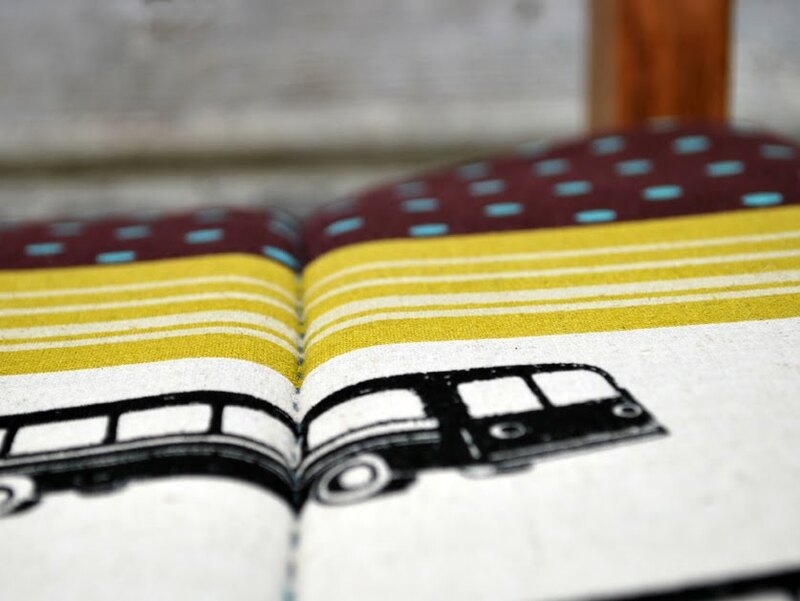 Love the echino fabric. Get cracking with parts 2 & 3 would ya. Bet you can't stop looking at it....? Flippin' gorgeous! Oh how I love treasure found at the side of the road! It looks fabulous. Well done. The sore fingers are well worth it. LOVE!! 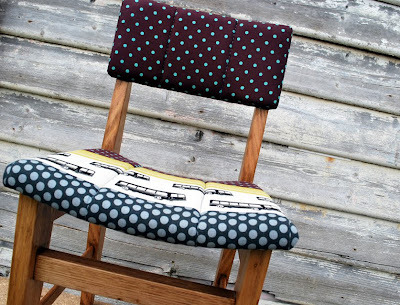 Clever you and what a gorgeous fabric choice..
Oh my what a great job ! Love them bones. What a clever lady you are. Looks fantastic! That is SO GOOD! GOsh - I see thongs like this and I think - oh I could do this but know I would never pul it off... way to go! Gorgeous. And, after a month or so has passed, it seems fitting that we could ask, "What are you waiting for, a BUS? ":) But really, love your fabric choices. Lucky little abandoned chairs, you have found your family. I can certainly picture how much work was involved - well done! It looks fantastic, and distinctive and well executed. And now you have a bloomin' masterpiece to sit on! Lordie woman, is there anything you can't do..? Apart from maybe bringing yourself to get Gary the tattooist to do his thing, there is not one thing I can think of. Clever chicken!! Is there any craft you can't master? what a gorgeous chair! funny how i thought you got all three of them done in that time. ;) the beauty of this one will give you strength to press on, yes? Blooming fantastic! I think I'm in love! Nothing like echino for a crafty make-over! Fantastic, really. I love them. I can totally relate too to the sore fingers; having sewn copious amounts of fabric to a lounge chair & then a pram, I know that about 3 hours in you start to think "Maybe this wasn't such a great idea..." but you can't stop with a half covered piece so you keep on keeping on. It does make the end result even more gratifying though. 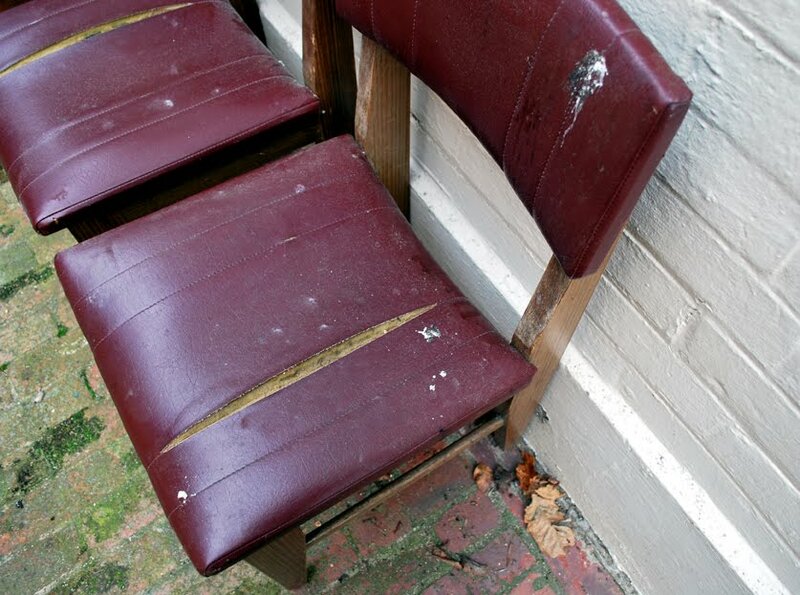 nice one, ive got 6 skanky dining chairs for you to do when youre done with yours! Wow! Very impressed, though sorry about the sore hands. A. lovely makeover. Holy moly. Is there no end to your talents? Want! Good on you for finishing a whole chair - hope that gives you the momentum to keep going, because it looks fantastic! Fabulous chairs! 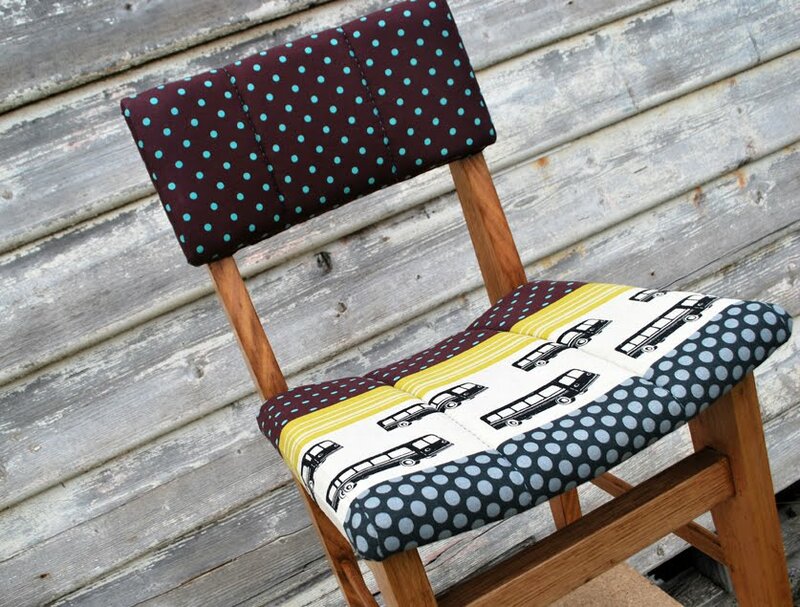 Now sit down with your knitting and a cuppa and contemplate the other two chairs for a while (or perhaps you don't want to get too close to them until they're Echinoed too)! Yay! OUtstanding transformation! 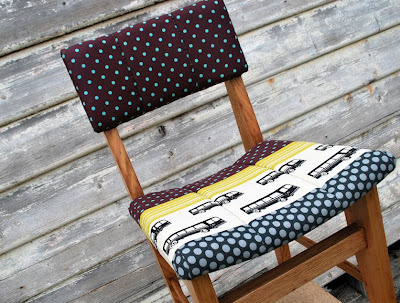 Gotta love a stinky roadside chair makeover. sadly your before photos look way better than my current kitchen chairs...so I was jealous at the 'before' photo stage. Imagine how I feel now I have seen the 'after'... don't have hard rubbish where I live. Obviously, otherwise I might have better chairs. Awesome! It looks like a brand new chair, I would never have guessed it was a re-do! Oh...my...I am speechless at the beauty that is radiating through my screen. I just love what you've done with those old bones! So super duper cool! Makes me want to go trawling the streets for good bones. oh wow Tania - fantastic job! Yes we know you, you are amazing!! That chair is sensational. I love it. Amazing. Oh can't wait to see the others. Totally inspiring. Holy Moly...that chair looks fan-friggin-tastic!! Brilliant. And what a lot of hard work you put in! On you go then, bus stop numbers 2 and 3!! Simply smashing! You've done a brilliant job on your roadside finds. I love a good freebie! you Do have an eye. Wow, your chair looks amazing!!! I love that fabric! You did a spectacular job, please don't give up! I'll keep sanding the maple cabinet doors we built (all 37 of them...and the 9 drawers) and start the staining assembly line if you start the other two. First one done gets the cookie! I must warn you, unless you have your own lusty woodsman, I just might finish first. But I know you can do it! 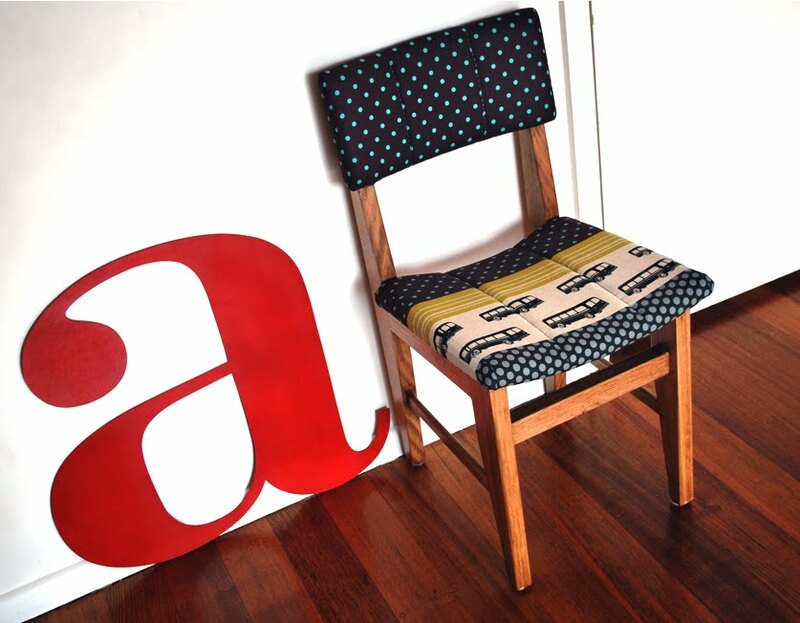 Look at that lovely finished chair! Cheers. Lots of people would pick up roadside crappe and not even get one-third of them new and improved. *ahem* So WELL DONE! The timber has come up beautifully and the fabric is perfect. Hope your fingers feel better soon! It is GORGEOUS!!!!!! you are sooooo clever, I admire all the hard work you put in, I would of given up I think and so I would never have such an awesome chair as yours!! ok, that is just fantastical! I cannot believe you transformed such a scary looking chair into something so freaking beautiful! 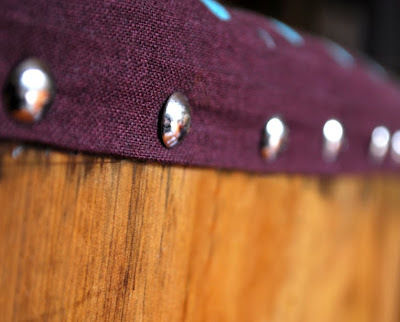 I absolutely love, LOVE, that fabric...that is right up my alley! I love the big giant "a" as well...very cool. How did you get so cool...and talented? Your blog is always impressing me to no end. Hope you get around to the other 2 chairs!! It's gloriousness takes my breath away. Worth every ounce of hard work. You've performed a chair miracle there! That is one most amazing chair. It really looks as though it has a tale to tell. Which I guess it does! Sorry I haven't posted about my lovely brooch yet, my camera committed suicide and I'm waiting for a new one to arrive. wow! you've done a great job and all that yuk stuff has become beautiful!! A truly inspired transformation! No wonder you're so chuffed. My mister says your weatherboards need painting. I say I love your chairs. i want to see how you did the hand stitchery....i keep looking at the sweetness of this chair wondering how you did that stitching. that is a very very very very very very very very very cool chair. smiling!